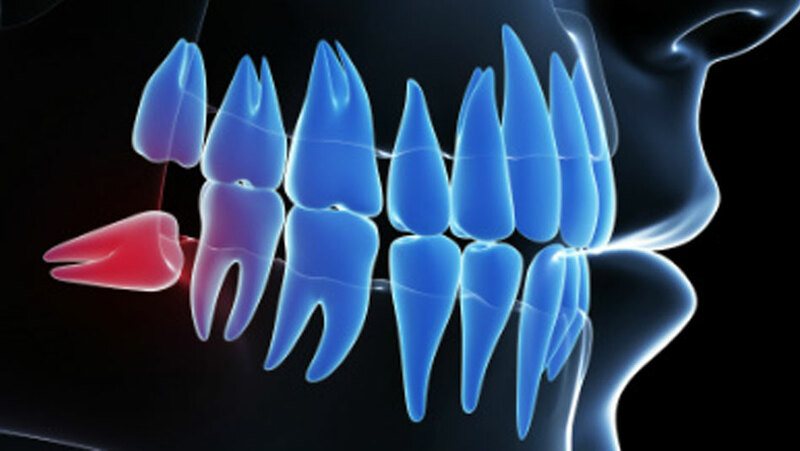 Wisdom teeth are 3rd molars (back teeth) which usually come through around the late teens or early 20s. There are normally two wisdom teeth in the upper jaw and two in the lower jaw. Some people have less than four or even none at all. This is all normal. When present, wisdom teeth can cause problems such as tooth decay and gum infections. This is usually because there is not enough space for them or because they grow on an angle. To prevent complications, it is best to have problem wisdom teeth taken out sooner rather than later. At New Millennium Dental, we offer flexible options for wisdom teeth removal under local anaesthetic or sedation in our state-of-the art Bentleigh facility or under general anaesthetic at the hospital. Call us on 0395570957 to find out how we can help you with wisdom teeth problems. When there is not enough room in the jaw for wisdom teeth, it can stop them coming through properly. When a wisdom tooth comes through at an angle, it pushes into the gum or the tooth beside it. This is called impaction. A wisdom tooth on an angle can't help with chewing, which makes it useless and sometimes painful. Brushing and flossing these teeth can also be difficult. Food and bacteria can get stuck between the wisdom tooth and the tooth next to it, ultimately leading to tooth decay, gum infections & wisdom tooth pain. In the upper jaw, crowded wisdom teeth often lean sideways and rub against the cheek. This may cause ulcers on the cheek and chewing problems. Both upper & lower wisdom teeth may push the other teeth closer together and affect a person's bite. That's why we often recommend removing impacted wisdom teeth before commencing a course of adult orthodontics. Wisdom teeth don't usually cause any pain until they start to do damage, so it is best to find out if your wisdom teeth are likely to cause problems sooner rather than later. The roots of wisdom teeth are still forming in a teenager so it is easier to take them out at this age. It may be more complicated if a person waits until later in life, when the roots are fully formed. Infections caused by wisdom teeth can be treated with antibiotics and wisdom teeth pain relief with painkillers is usually required. However, the infection and pain may keep coming back if problem teeth are not removed. People who have other health problems, especially those with lower immunity, may have complications from these infections. At New Millennium Dental, we offer flexible options for wisdom teeth removal under local anaesthetic in our state-of-the art Bentleigh facility or under General Anaesthetic at the hospital. Dr Jaclyn Wong is accredited at Masada Private Hospital, St.Kilda East and Bellbird Private Hospital, Blackburn for General Anaesthetic purposes.